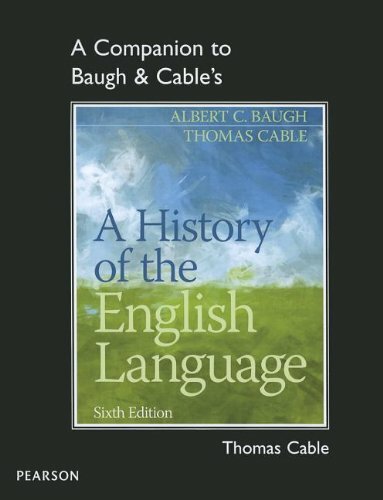 Author(s) Thomas Cable Baugh, Albert C.
In the spirit of the main text, the Companion pays attention to the linguistic effects of social, political, and literary events. The maps are designed to set the geographical contexts for these cultural influences during the Indo-European period, the Middle Ages, and the eras of the British Empire and of American ascendancy. The pre-chapter on The Sounds of English contains phonetic information and exercises that should be helpful in most of the chapters that follow. The Questions for Review that begin each chapter give an overview of the most important topics in each period and serve as a checklist of items that should be familiar in any discussion of the history of English. Now that we are into the second decade of the twenty-first century, a twelfth chapter has been added to the main text. Because English as a global language is a central issue in its history at this point, the questions for review in Chapter 12 raise topics for discussion concerning the major languages of the world, prospects for the future, and less obvious issues such as the relative complexity of languages. The headings for most sections are followed by a corresponding section number in the History.On many topics the amount of exposition preceding the exercises varies more or less inversely with the amount in the History, the idea being to have a full discussion of important topics without a duplication between the two books.